The Darwin World Push Pin Map is an extraordinary topographic travel map in an old world style. It is named after Charles Darwin, the 19th century English naturalist who is best known for this contributions to the science of evolution.This stunning map is the result of months of cartographic and geographic research by a professional cartographer using professional GIS mapping software. The Darwin World Map features our own terrain modeling with 3D shading effects. I gave this map to my boyfriend for his birthday, and he said it's the best present I've ever given him! He loves it! It's so beautiful and looks great hanging on our wall. I was worried the frame might look cheap, but it doesn't at all - it looks very nice. I got the 24x18 and it's a good size. I'm very pleased with the whole process and would definitely recommend it to anyone! My map turned out perfectly! I have it to my husband for our anniversary and he loved it. We are so excited to dream of future adventures and mark it on our map. Stacie H. Reviewed by Stacie H.
My husband and I just celebrated our one year wedding anniversary and I was looking for the perfect "paper" gift idea. The team was so helpful and tentative to my requests when designing a map to my exact requirements. My husband loved this map with all of the history included in the design of the map itself. It was definitely worth the investment! The map is beautiful! I love the colors - they are just as they appear in the picture. The map also has a lot of interesting pictures as a part of the background - they add great texture from far away and are neat to look at up-close. My daughter loves to look at it! It is a fun to have a personalized piece of interactive art in our home! Debbie worked with us to personalize and make changes we wanted in the design. 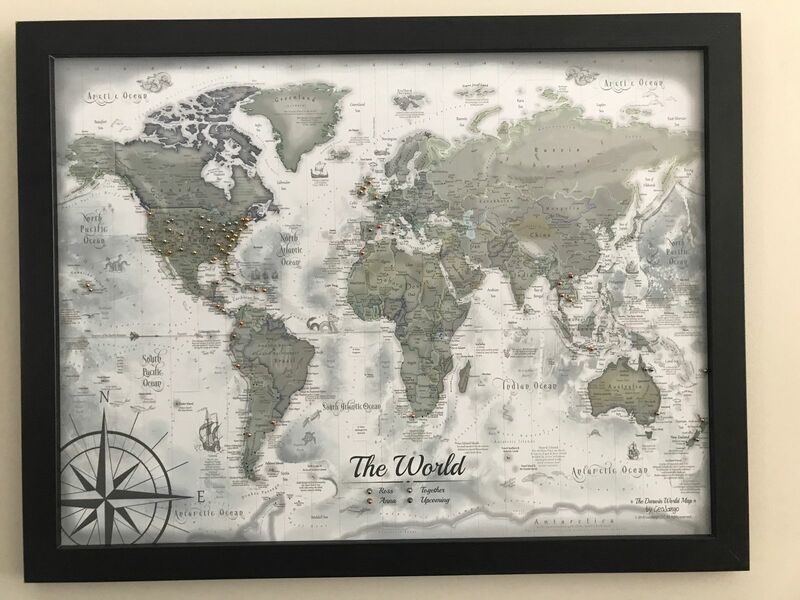 Bought this for a dear friend who loves to travel in celebration of a special birthday. It was beautifully produced (we had a custom message added) and the service was fantastic. It arrived when promised in perfect condition.